Can you donate blood if you have herpes or another STD? With January being national blood donor month, this question is undoubtedly on the minds of many. Whether you have herpes or another STD, or you are STD free, you might be curious about restrictions for donating blood as they relate to a donor’s STD status. When donating blood, most donation centers prefer that you be as healthy as possible, and that includes being free of many viral infections ranging from the common cold to HIV. But what about other common infections, such as herpes? The important distinction between herpes and certain other STDs, especially when compared to a virus like HIV, is that herpes is not a virus that is present in the blood. Because herpes is only communicated through direct skin-to-skin contact, the blood of a patient infected with the herpes virus cannot pass herpes to another person through a blood transfusion. However, there are still some important restrictions and stipulations for people who have herpes symptoms when it comes to donating blood. If a donor has herpes and is taking any kind of antiviral medication for it, most donation centers require that the donor wait at least 24 hours after completing the last dose of medication before donating blood. Most blood donation centers also stipulate that someone infected with herpes cannot donate blood if they are currently experiencing their first ever outbreak of the virus. Because the first outbreak is typically the most severe for patients, it is possible at the time of outbreak for a small amount of the virus to enter the bloodstream. But what about other STDs? Typically, in addition to herpes, you can donate blood if you have chlamydia or HPV, are feeling healthy and meet all other eligibility requirements. Obviously, because HIV and hepatitis can be transmitted through the blood, people who are HIV or hepatitis positive cannot donate blood. In many cases, potential donors who not HIV positive but are involved in behaviors that could be associated with the risk of HIV transmission may also be prohibited from donating blood. If someone who is HIV or hepatitis positive and does not know they are HIV or hepatitis positive donates blood, that blood is not used for transfusions. All blood that is donated, regardless of the donor’s self-reporting, is screened for HIV, hepatitis, syphilis and other infections or conditions. Blood that does not pass these screenings is not used for transmissions, and typically the donor is notified that their blood will not be able to be used. However, it’s still possible to donate blood if you have had other curable STDs in the past. According to guidelines set by the American Red Cross, you must wait 12 months after treatment for syphilis or gonorrhea or syphilis before you are eligible to donate blood. 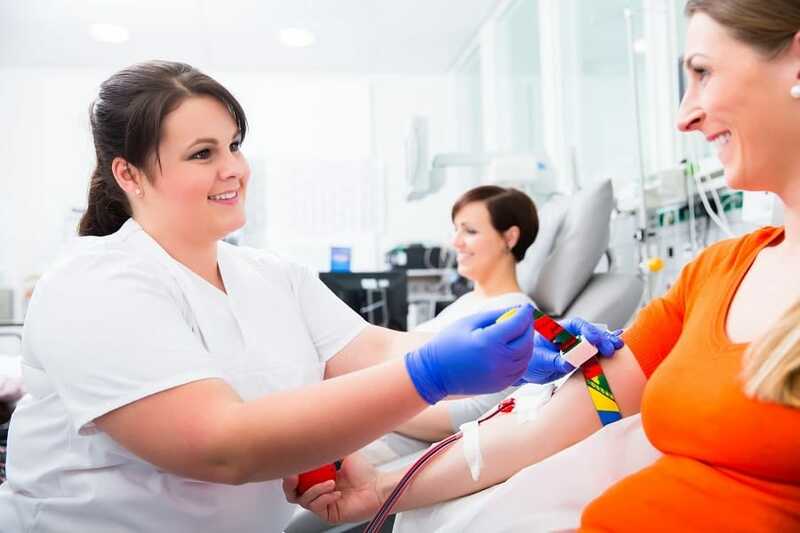 While these guidelines can answer the question of can you donate blood if you have herpes or other STDs, the important thing to note is that donors should not rely on blood donation centers to make sure their blood is healthy enough for donation. Donating blood that ultimately will not be used is a waste of time and resources, and could be potentially harmful to others. That’s why it’s important to know your status, as it relates to STDs or other ailments, before you donate blood.